Need a credit card processing solution for D365? What you used in Microsoft Dynamics AX is probably not what you want for Microsoft D365 F&O. That’s because most payment gateways are horribly outdated with current payment processing requirements. Aside from PCI compliance, equally critical is compliance with the card network rules. Does the payment gateway support Unscheduled Credential On File? How will you identify expired authorizations and update them? If the initial authorization and final settlement are different, how does the payment gateway manage the authorization so that you can meet requirements for level 3 processing? D365, ERP, and ecommerce consultants are generally not great resources for the last mile- getting paid, because it’s not their core expertise. If anyone tells you here are two or three options, you choose whichever you want, RUN! Each payment gateway has unique attributes. You need a consultant that not only knows payment processing, but also knows differences between payment gateways and how each will help or hurt your goals. How can you find a good D365 payment gateway consultant? While there is not a specific certification that is critical, it helps to have some type of certification vs just experience. The PCI Council offers a few different options, all of which are expensive which is why most people won’t bother getting them. However, because level 4 merchants are required to use only PCI QIR certified individuals, the PCI Council has lowered the cost (as well as the complexity, but that’s another story) to increase the number certified. Since you’re reading this article, you’re looking for expert help. You’ve found it. I’ve been blogging about payment processing for years. I have used, sold and implemented solutions for authorize.net, PayPal, Payflow Pro, CenPOS, First Data, Chase Paymentech and many, many others. I’ve analyzed merchant statements, ecommerce shopping carts, ERP’s, merchant processors / acquirers, and a host of solutions that interact to impact merchant security, fraud risk, processing fees, and efficiency. Because I’ve seen what happens after the sale, including non-qualified transactions, chargebacks, risky security practices that often go against company policy but employees do it anyway, and more, I’m in a better position than most to give you the best advice for business to business, business to government, large transactions, card not present sales and specialty retail. If I don’t know it, I research everything and ask lots of questions that consultants and merchants don’t know to ask. The Christine Speedy difference. PCI compliance is important to mitigate data breach risk, but equally important is compliance with complicated card network rules. Have you read any of the 1,000+ pages of Visa Rules? Or 300+ Mastercard transaction processing rules? Have any of the people you rely on? I’ve spent countless hours educating myself on them and learning about the nuances that impact your profit and risk. Technology directly impacts compliance. It doesn’t matter how big or how old a company is; the reality is most players in the payments industry fall behind with every new rule that comes out, even though these rules are usually announced years in advance so that they can prepare. Call 954-942-0483, 9-5 ET for expert advice about all things payments. Microsoft Dynamics AX and D365 users need a more customized invoice and sales receipt subject and body than they have with their current solution. The CenPOS F&O accounts receivable module includes the 3 most common requests users ask for. Create a custom subject and automatically insert the invoice number. For example, Sales Invoice # 231255. Create a custom body plus automatically insert subtotal, invoice #, sales tax, discount, total invoice etc and a click to pay link. 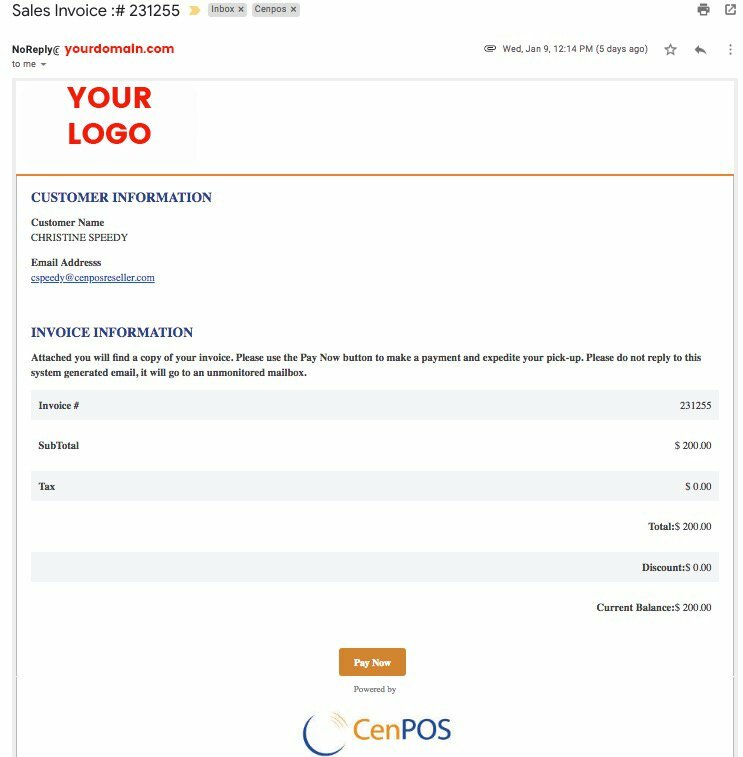 Invoices can be delivered via multiple methods and customers can pay via ACH, wire, credit card and other payment types directly from the email or text; customers can also login to a portal to view and pay multiple invoices. This increases efficiency for both parties and is proven to reduce DSO Because CenPOS is both the invoicing solution and a PCI Level 1 Service Provider, merchants can eliminate Red Maple Advanced Credit Cards, Billtrust and similar other third party solutions. The sales receipt works pretty much the same way, with receipts automatically delivered via the customers preferred communication method. The CenPOS F&O module is quick and easy to implement. All these features and more are available standalone or integrated. Integrators, developers and Dynamics users can contact Christine Speedy at 954-942-0483 for the module. Call Christine Speedy, CenPOS Global Sales, PCI Council QIR certified, for the CenPOS Dynamics AX and D365 modules to make your business more profitable, efficient and secure. 954-942-0483, 9-5 ET. CenPOS is an integrated commerce technology platform driving innovative, omnichannel solutions tailored to meet a merchant’s market needs. Providing a single point of integration, the CenPOS platform combines payment, commerce and value-added functionality enabling merchants to transform their commerce experience, eliminate the need to manage complex integrations, reduce the burden of accepting payments and create deeper customer relationships.